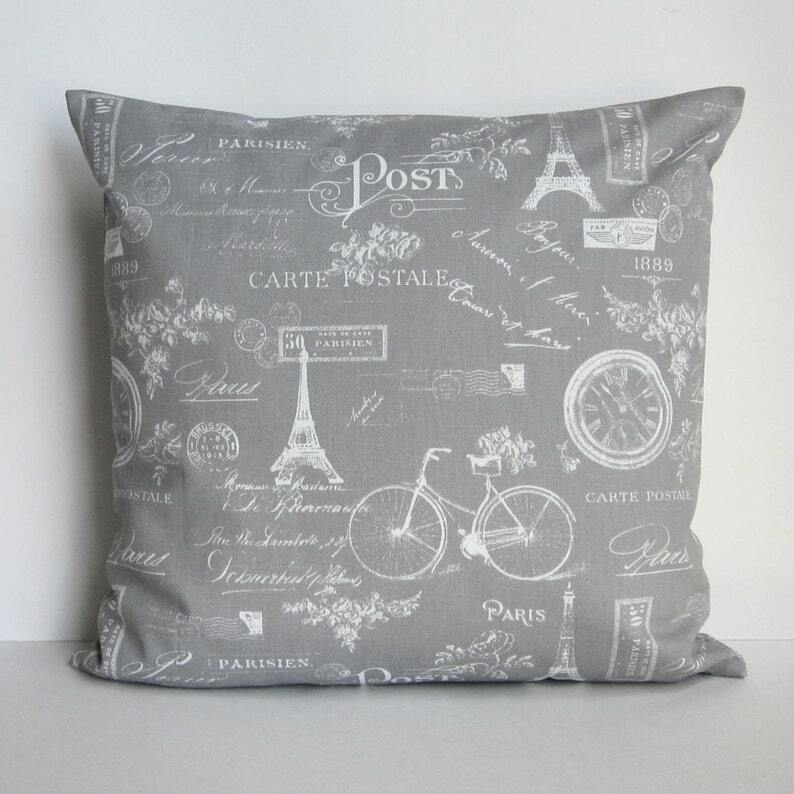 One, Paris themed throw pillow cover in gray and white. The perfect pillow cover for any room with a Parisian theme! This pillow cover is part of my coordinating gray and white collection. You may access the link below. • Care: Hand Wash. Dry flat. Low iron if needed. Do not dry clean. • Pillow form not included. Forms are available online and at craft and sewing stores. RECOVERING YOUR EXISTING PILLOW? Measure carefully! Place your pillow form on a flat surface and press down to get it as flat as possible. Measure straight across the middle of the form, not the edge. I recommend new forms if your current pillow form is greatly misshapen. SIZING NOTE: My pillow covers are made to industry standards. They are approximately one inch smaller than the stated size, so that your pillow cover has a snug, professional fit. Purchase the same size pillow cover, as the form that you are using . I have already done the adjusting for you! ABOUT KNIFE EDGE SEAMS: Unlike many handmade pillow covers, all of my pillow covers have knife edge seams on all sides for a crisp, professionally made appearance. It's more work for me, but you receive a premium quality product, handmade with care and attention to detail. All of my products are handmade in my smoke free, pet free home. I welcome custom requests! These pillow cases are expertly made and look just like the picture. Also, they were shipped quickly. I'm 100% happy with my purchase. The pillow cover is absolutely gorgeous! And the quality is fantastic. Love it!! I accept payment through Etsy Direct Checkout. FLORIDA RESIDENTS: All Florida residents will be charged 6% sales tax on items. CUSTOM ORDERS: Full payment is due when a custom order is placed. I will inform you about my production time and keep you updated on my progress. All of my items are handmade with the same care and attention to detail I give when creating something for my family and friends. Since it is difficult to be delighted with an item that you are not pleased with, I will do everything possible to make you happy with your purchase. RETURN/EXCHANGE POLICY: If you are unhappy with your purchase, I will gladly accept its' return or exchange, when notified within seven (7) days of receiving your order. A 25% restocking fee will apply for all RETURNS, and will be deducted from the subtotal (items only) amount. Complimentary swatches are available upon request. No returns or exchanges after seven (7) days. I must be notified through Etsy Conversations/Email that you desire to exchange or return an item before you return the item. Items must be mailed, and tracking number sent to me within three (3) business days of my email reply with return shipping instructions, and a tracking number must be sent to me, within those same three (3) business days, in order to receive a refund or exchange. Items that are returned without prior contact with me, or without receipt of a return tracking number will not be eligible for a refund/exchange, and will be returned to you. All returns or exchanged items must be in the original, unused, unwashed, undamaged condition, and free of pet hair, and the smell of smoke or pet odors for a refund or replacement. PLEASE NOTE: Any items with pet hair on them, will NOT be accepted for return/exchange, and will be returned to you. NO EXCEPTIONS WILL BE MADE. Buyer is responsible for return shipping costs. Only the purchase price is refundable, if a refund is requested. Shipping costs are non-refundable. Expedited Production Time fees are non-refundable. CUSTOM ORDER RETURN POLICY: Custom orders are NOT exchangeable/returnable unless, I believe that I will be able to sell the items. Any custom items that I deem acceptable for return, must be returned in the conditions stated above. Shipping charges are non-refundable. It is important to me that you are happy with your custom order, and I will do everything possible to make sure that you are pleased. Good customer service and happy customers are important to me! NON-CUSTOM ITEMS- Ship within 1-3 weeks. This does NOT include Saturday and Sunday. CUSTOM ITEMS- Ship within 2-3 weeks. This may be sooner depending on how many custom orders I have at the time. Please contact me before purchase, if you need your order sooner and I will give you an estimated shipping time. Orders are shipped by USPS First Class Mail or Priority Mail depending on the pillow cover size, fabric weight or number of items in your order. Items arrive in 3 - 5 business days with First Class shipping. Shipping fee includes tracking. If you desire Priority Mail (2-3 business days shipping time), please contact me before purchase, so that I may adjust your shipping fee. Priority/Express shipping is available. Please contact me before purchase for this option. All items are shipped by USPS First Class International Mail- Items arrive in 5 - 20 days with no guaranteed arrival time due to customs. Shipping fee includes tracking. Priority and Express shipping are available. Please contact me before purchasing for this option. VAT and/or customs duties are the responsibility of the customer. I am not responsible for VAT fees or customs duties. VAT is not included in my prices. All items are shipped by USPS First Class International Mail- Items arrive in 5 - 20 days with no guaranteed arrival time due to customs. Tracking is not available for some countries. FEEDBACK- I gladly welcome positive feedback! I believe that excellent customer service and a quality product are the foundation of a good business and there should never be the opportunity for negative feedback! If you are unhappy with your purchase for any reason, please contact me before leaving negative feedback. I will do everything possible to work with you to make you happy and satisfied with your purchase. Much care and attention is given to each handmade item I produce. I use premium quality materials and give careful attention to construction details and to special requests. All items are created by me, in my pet free, smoke free home. I appreciate your valuable time spent in my shop and hope that you find the perfect pillow cover for your decor! My pillow covers are made according to industry standards. The finished size will measure approximately 1/2 - 1 inch smaller than the stated size to give a snug, professional fit. Order the same size pillow cover as the pillow form that you are using. Have an 18x18 form? Order an 18x18 pillow cover. Please refer to the individual listing/item details for recommended care instructions. Exchanges and Returns are accepted when notified within seven days of receiving your order. Custom items and sale items are not returnable/exchangeable. Please refer to the full exchange/return policy for details and exclusions. Production Timeline- How long does it take for my order to ship? Each zipper pillow cover is made to order. Envelope closure pillow covers are in stock, and ready to ship. MY CURRENT PRODUCTION TIME IS 1-3 WEEKS. It rarely takes three weeks for an item to be completed and shipped, but occasionally I receive a great number of orders at one time, and production time may take longer. Rush Production and Rush Shipping options are available. Just contact me! All orders are shipped through the US Postal System. For United States destinations, orders of 1-2 pillow covers ship by First Class 3-5 Day Mail, and orders of 3 or more pillow covers ship by Priority 2-3 Day Mail. For International destinations, orders are shipped by First Class International Mail, and may take 5-20 days for arrival. Customs fees are the responsibility of the buyer. All orders include insurance coverage and a tracking number which you'll receive once your order ships. Priority and Express mail upgrades are available for U.S. destinations. Just ask!